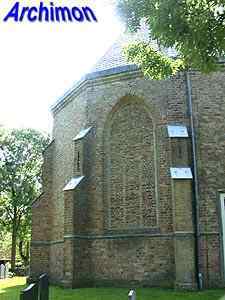 The history of Nijland, Frisian name Nijlân, began in the 13th century when it was founded as the first village on reclaimed land in the former Middelzee. 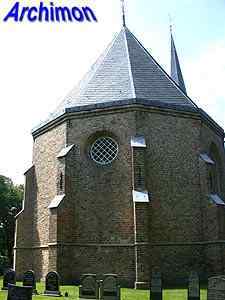 The village grew in circles, concentrically arranged around a church, the St. Nicolaas. 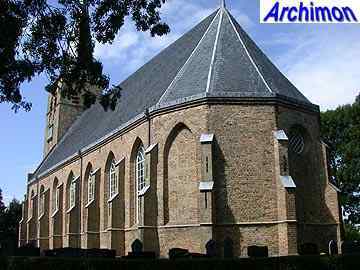 According to a myth the location for the church was chosen by letting two oxen wander for a night, after three earlier attempts at building a church at a different location had failed by the intervention of the hand of God. 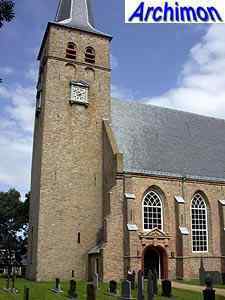 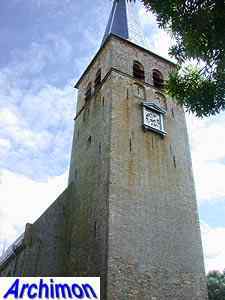 The tower of today's church is its oldest part, dating from the late-13th century. 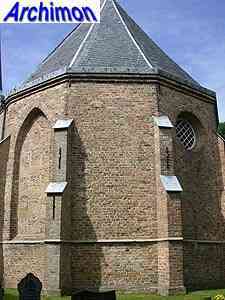 Although built in the Romanesque period it is devoid of any characteristics of that style. 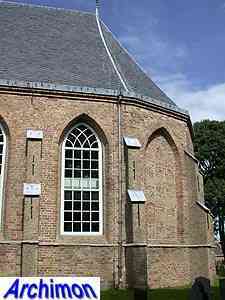 The two closed arches on each of its four sides are former sounding holes, closed when in the 17th century the tower heightened. 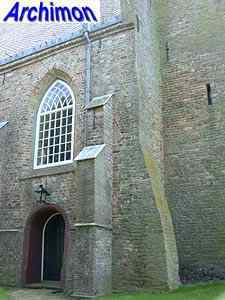 This upper part may have been the cause of the tower sagging towards the south-west. 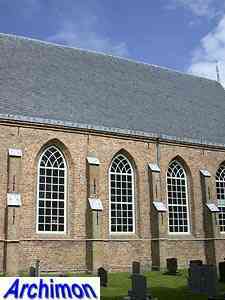 In 1866 it was found to be leaning one and a half meters and there was danger of it falling down, tearing down the nave with it. 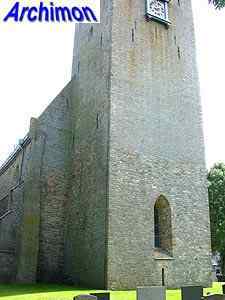 Although there had been plans to demolish it, in 1866 the tower was put straight. 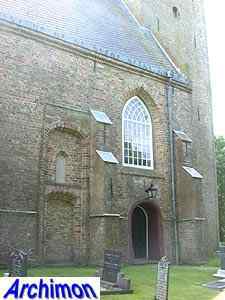 The original church itself was replaced in the second quarter of the 16th century, except for a small part of it which was incorporated in the north wall. 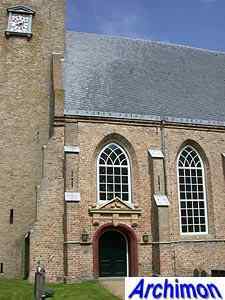 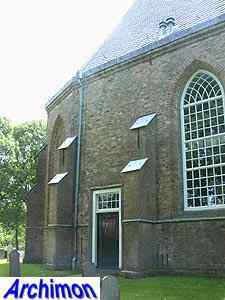 The current aisleless church is in simple Gothic style and has a five-sided choir. 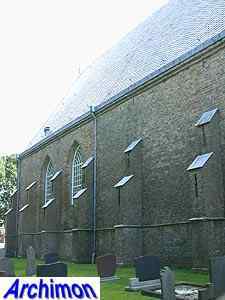 Its walls, including the facade, are supported by unusual big stepped buttresses. 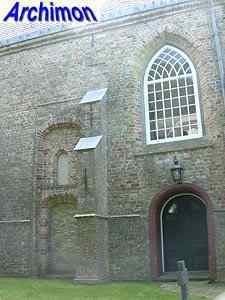 In the south wall of the nave a portal was added in ca. 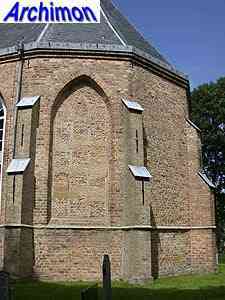 1600, which in 1664 was decorated with a tympanum.